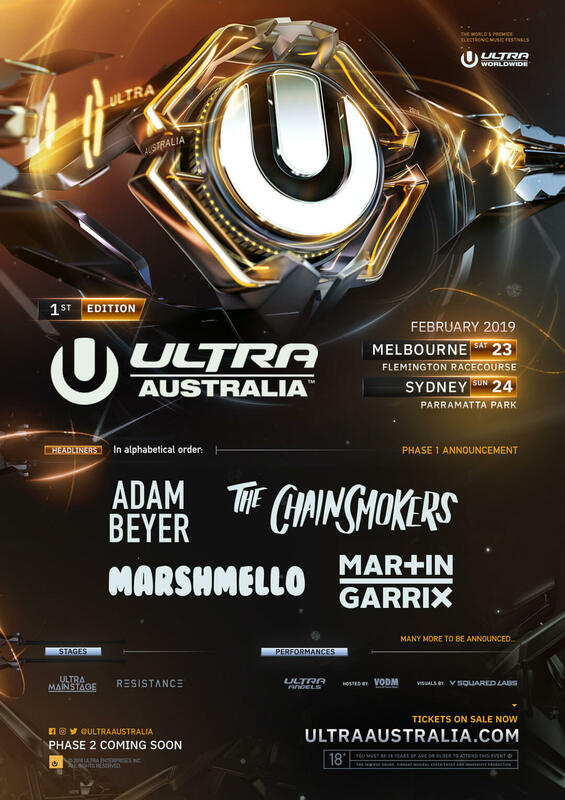 Following the success of the sold out, first ever ‘Road to ULTRA Australia’ in February earlier this year, ULTRA Worldwide recently announced the massive expansion of the globally renowned festival to two cities across the Australian continent Saturday 23rd and Sunday 24th February. Now, the festival has released an electrifying Phase One lineup packed with the industry’s hottest artists to even further excite those in the land down under. With its growth into a full scale festival, Ultra Australia has proudly announced the addition of new stages in addition to its iconic Main Stage including the immersive, techno-heavy RESISTANCE Stage. Headlining the Main Stage all weekend will be international superstars The Chainsmokers (LIVE), Dutch wunderkid and DJ MAG’s #1 DJ Martin Garrix and the veiled Marshmello, all who will be making their Ultra Australia debut. Meanwhile, the Don of Drumcode, Adam Beyer, will be leading the charge for the RESISTANCE debut in the land down under. After the thrilling debut of ‘Road to Ultra’ in Melbourne this year, we are beyond excited to welcome the full scale ‘Ultra’ experience to both Melbourne and Sydney in February 2019 for ‘Ultra Australia.’ After watching the success of the event in Miami over the last 20 years and across the globe, it’s time we experienced this fantastic festival down under! Showcasing ‘Ultra Australia’ at two of the nation’s premiere venues in: Flemington Racecourse, Melbourne & Parramatta Park, Sydney, we are counting down the days ‘til Summer. Ultra Australia will first touch down in Melbourne on Saturday 23rd February at Flemington Racecourse, before venturing north to Sydney on Sunday 24th February at Parramatta Park. Tickets to both events can be found on UltraAustralia.com/tickets.